Karena Graham is one of Ireland’s most experienced models. She has worked alongside all of Ireland’s top models, Modeled for Ireland’s top brands and shot with Ireland’s top Photographers …*cough cough*. 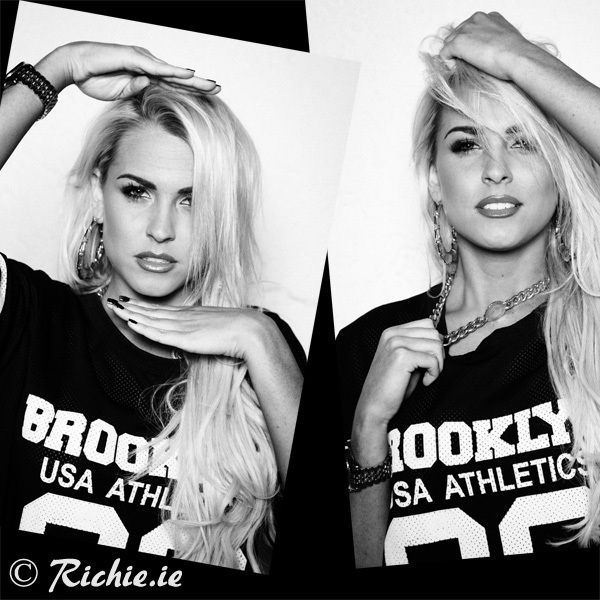 She is Miss Irish Sun 2010 and joins the ranks along the other Miss Irish Suns that I have shot. Speaking of shoots, check out these images from her portfolio shoot recently. She has recently just move to Andrea Roche Agency to become even bigger and better. She came down to me to update her portfolio along with her friend Leah O’Reilly ( her shots). Contact me to book in your own photoshoot to start or update your portfolio. No doubt as you can spot the obvious that she is the image of Claudia Schiffer. Karena even done a shoot before appearing to be Claudia her self, while Georgia Salpa was there as a Kim kardashian lookalike. On our shoot, Aimee Connolly was at hand again with her wonderful Make-up skills. We were looking for some classic black and white looks. As you can see, I think we pulled it off. Karena is fantastic model and is great to work with, she brought plenty of ideas to the shoot and is not afraid to try things out…. which always makes the photographers job easier. Shout out to Aimee Connolly for the fab hair and makeup work as always. Nicola Hughes is busy model with Assets Model Agency, Andrea Roche Agency, whom I have the pleasure of shooting with recently. She has been modeling for a while now and is doing great for her self. She is great to work with and has fantastic skin, which makes the MUA’s & my job easier…… which we like. I organised a test shoot just before Christmas with Nicola & Alyson. We wanted to get some Christmas themes shots as well as trying out some new looks for our portfolios. It was a short day, but we managed to squeeze in some varied look in the two hours shooting with the two girls. Here are are some of the best shots of Nicola from the day. I look forward to working with her again. The style team on the day were Danilo Taveres on Hair, Ann-Jean Fitzsimons on Make-up and Gill Keogh on styling. Check those talented guys out.